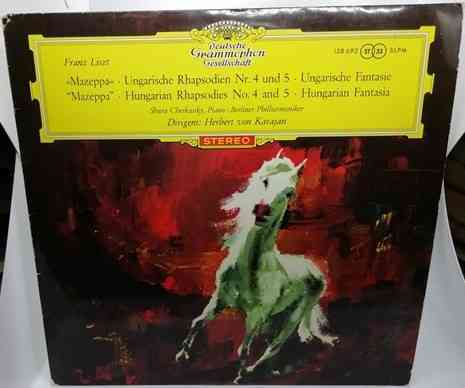 33rpm LP Record including Hungarian Fantasia and featuring Shura Cherkassky on piano. Berlin Philharmonic Orchestra conducted by Herbert von Karajan. Issued on the Stereo Deutsche Grammophon tulips label in 1961. German pressing. Red stereo sleeve. 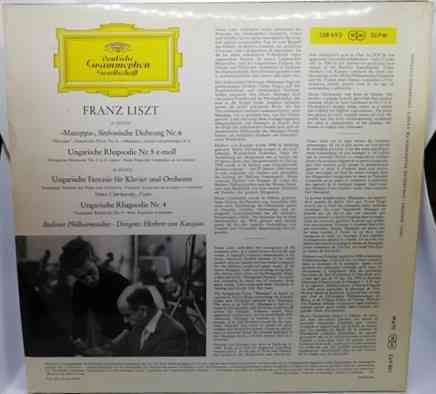 33rpm LP Record of SLPM 138692 Liszt MAZEPPA - HUNGARIAN RHAPSODIES and Hungarian Fantasia featuring Shura Cherkassky on piano with the Berlin Philharmonic Orchestra conducted by Herbert von Karajan. 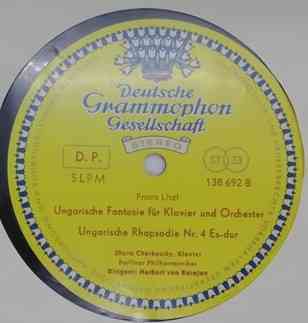 It was issued on the Stereo Deutsche Grammophon tulips label in 1961. German pressing. Red stereo sleeve. The record itself is graded at least excellent, with no more than the odd light surface mark visible when viewed under normal house lighting. Play-tested on a USB turntable. Superb sound quality with no jumps, ticks, pops or crackle. More or less faultless playback. The outer sleeve is graded a bit less than very good, with some rubbing to edges and corners, light creasing and faint ring wear. The spine is intact and pretty strong with a small amount of loss to the lettering due to rubbing. The inner sleeve has no wear to speak of.